Zutto Bento is a Japanese eatery that took up residence in Rosalie a few months ago. Not being locals in the area, we would not have known about it, had it not been for an invitation to visit. 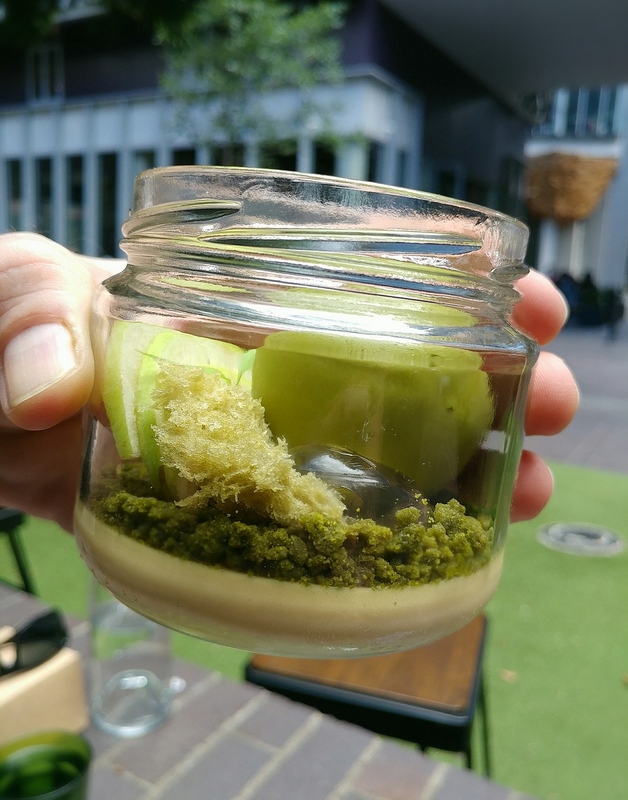 Given that Japanese is our favourite cuisine (we have more than just matcha), we were keen to check them out. 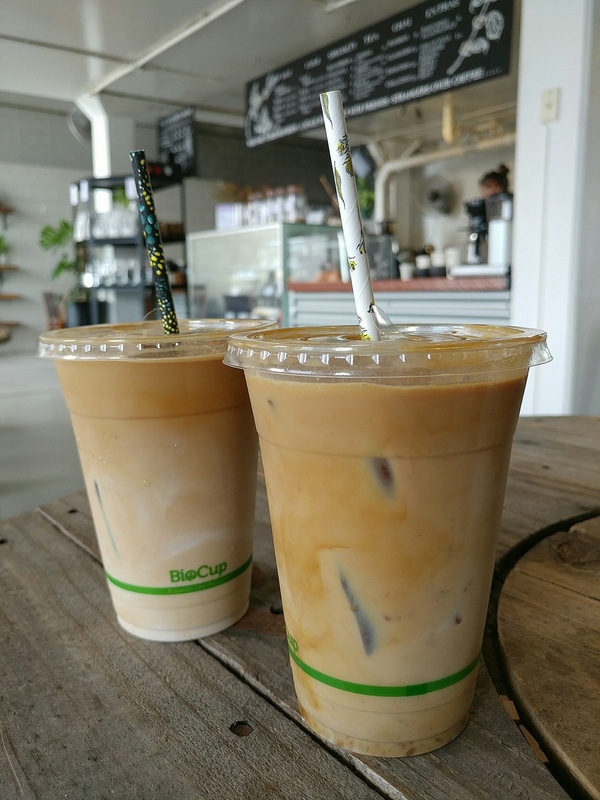 In the eatery hub of Rosalie Village, it is nestled a little off the main Nash Street frontage, just behind where Grill’d is. While there is an A-frame with the menu out on the pavement, the restaurant itself isn’t where there is lots of foot traffic, so even if you were in the village, you might not come across it unless you were specifically looking for it. The outside of Zutto Bento. There is clear signage outside of the restaurant, with “Zutto Bento” on bold letters above the entrance. 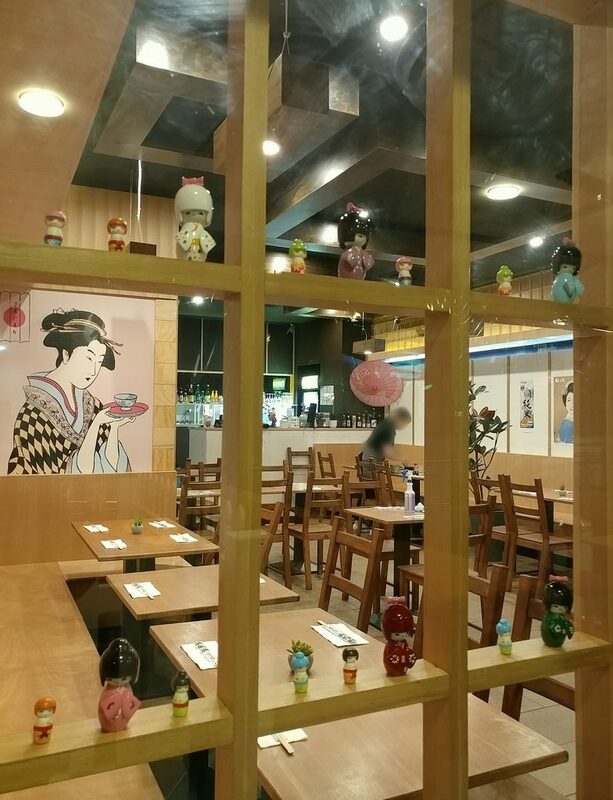 Behind the glass on either side of the door are wooden grid shelves, and little kokeshi dolls line these, giving the restaurant an endearing charm even before you step in. Noren curtains at the entrance are tied to the side to make it easier for patrons to see in and walk through the door. 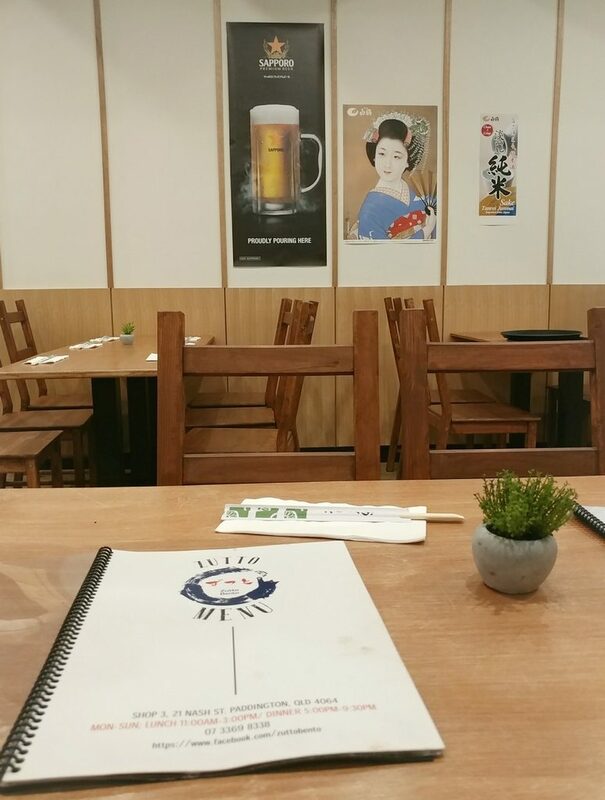 A glimpse into the eatery, with its classically Japanese decor. We were greeted soon after coming through the entrance (we noticed that they did that with all the patrons coming through, as you would get at an izakaya), and invited to sit at any available seats we would like. 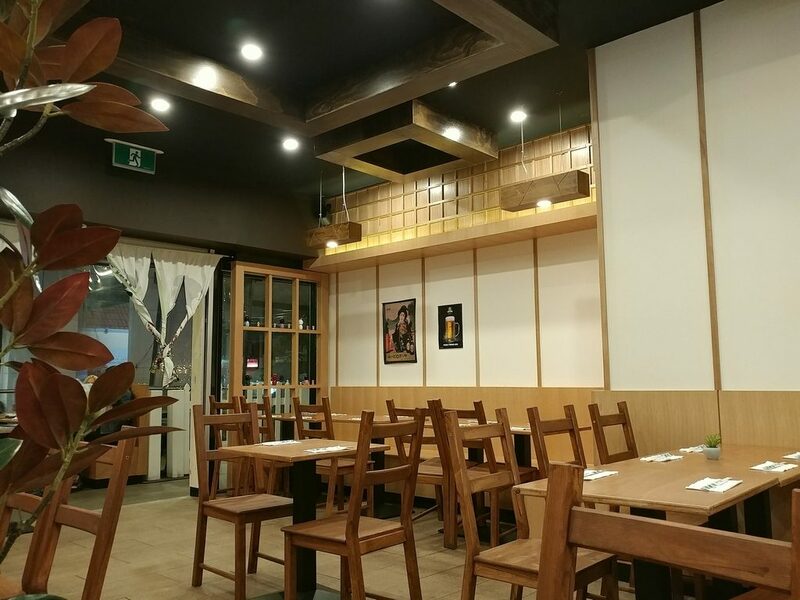 The decor is, of course, very Japanese in style, with the walls looking like shoji screens, and plenty of light-coloured wood used throughout. The tables and chairs were a simple, unfussy design, functional and homey. Small pots with artificial plants brightened each table. A few posters of geishas and Sapporo beer decorated the walls. Music played in the background at a comfortable volume, easy listening pop from what we could discern. It was relaxed, and not too incongruous with the setting. More of the interior. The lights embedded in the carved wooden blocks are a nice detail. 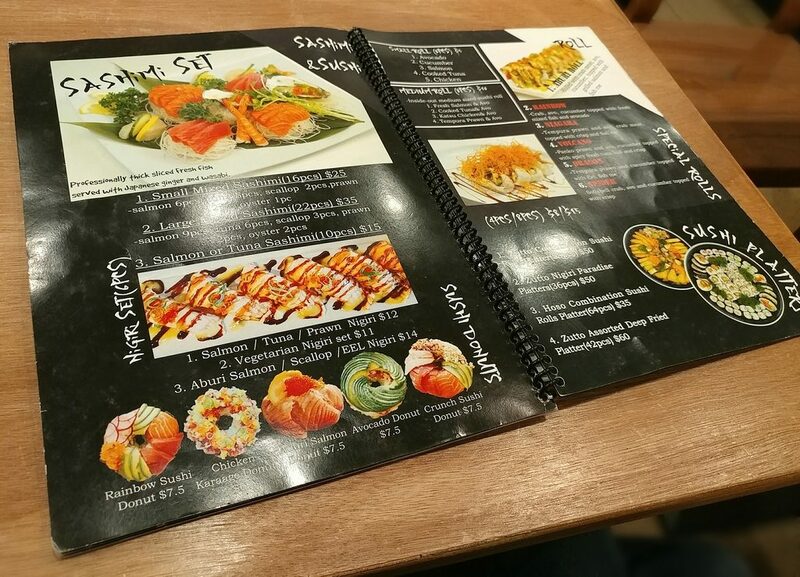 Menus were brought out to us, a bound booklet of pages of options, divided into sections of entrees, mains, with chicken, beef, pork, seafood, and vegetarian sub-sections, sashimi and sushi, rolls, a kids menu, and dessert. These were accompanied by tempting pictures to assist with the decision making (or increase the indecision). 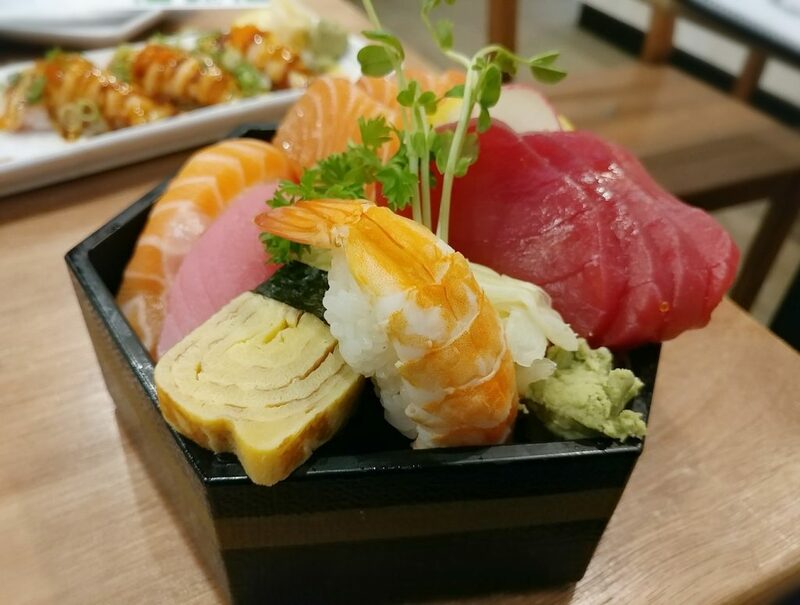 Despite being tempted by the entrees like the crab croquettes, okonomiyaki, and gyozas, we decided to sample their unique sushi doughnut offering instead. We also ordered a couple of their bentos as well, given that they are called “Zutto Bento”. We had hot green tea to accompany the meal. Piping hot mugs of the tea were brought out, each with a little dish to set your teabag aside in case you didn’t want your tea strong. Through the meal, staff regularly came to check if we wanted hot water to top up the tea. 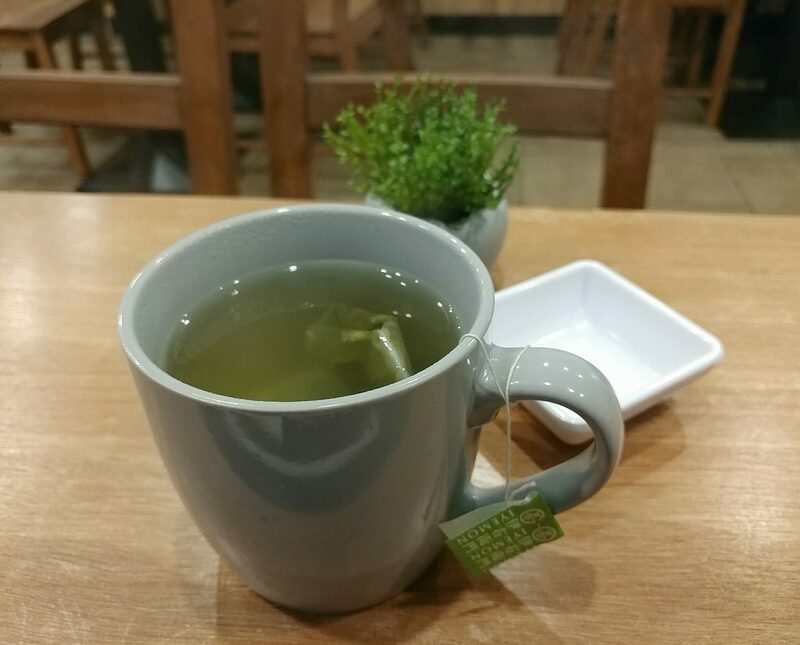 The mug of green tea. 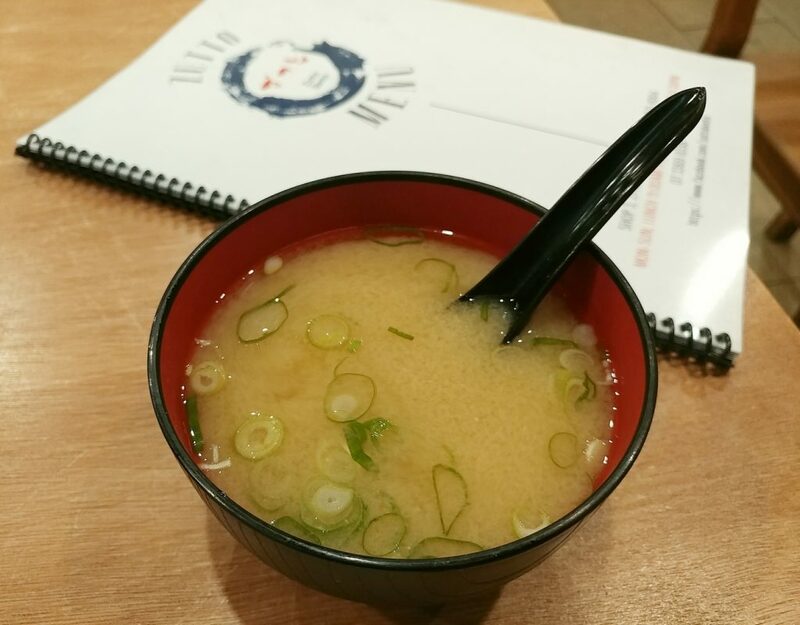 Miso soup, which is part of the bento sets, was brought to the table soon after we had placed our orders. This is a good way to assuage the hunger of famished patrons while the rest of their meals are being prepared. The hot soup was a pleasantly warming starter to have on a cool evening. It had good flavour, with the right amount of seasoning, so it had the right balance of salty and slightly sweet. Little tofu cubes, chopped spring onion, and seaweed gave it additional texture and flavour. What is a sushi doughnut? 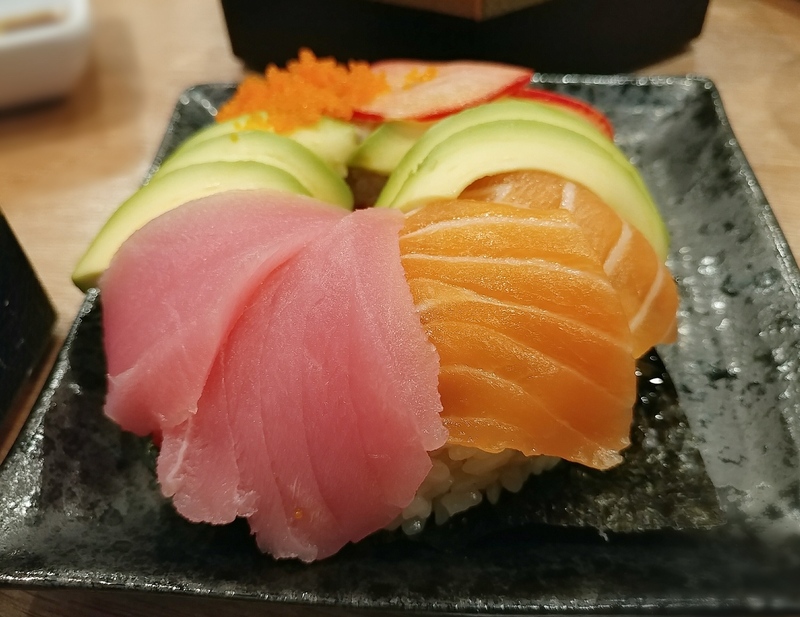 We were initially skeptical of this sushi in the shape of a doughnut, figuring it would just be nigiri in a ring form, more hype than substantial hit. There were a few sushi doughnut choices on the menu, including chicken karaage and aburi salmon. We picked the Rainbow sushi doughnut, as from the pictures, it had a variety of toppings on it. It was certainly colourful, with slices of salmon, tuna, avocado, pickled radish, and tobiko arranged around the ring. It sat on a nori sheet base. Staff brought out forks and spoons with it, and advised that we should eat it with those, as it would fall apart if we attempted to eat it with just chopsticks. We were even more dubious at this point, but once we started eating the sushi doughnut, our doubts dissipated. The salmon and tuna slices were fresh, and the avocado was perfectly ripe, with its own earthy flavour and creaminess. The pickled radish was a little sweet, a little tangy, and had a crisp crunch. The tobiko had a different popping crunch again. Kewpie mayo was drizzled underneath, between the toppings and the rice. The rice had also been mixed with a special sesame, soy, and wasabi marinade, so it was flavourful in itself, and there were pieces of tuna in the rice base as well. 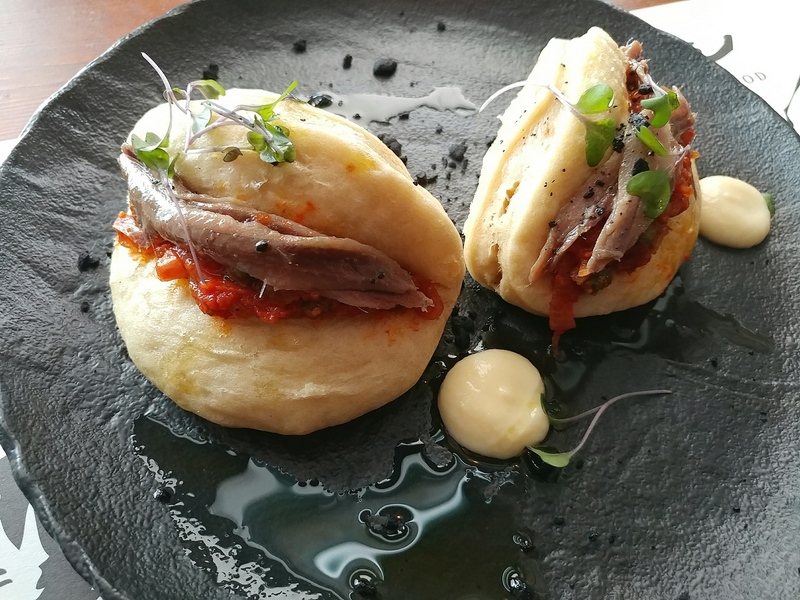 We were certainly converts, as Zutto Bento had evidently made this for more than just looks, and have thoughtfully incorporated a variety of textures and flavours, for an actually interesting eating experience. The Sushi Doughnut from another angle. A platter of aburi salmon nigiri was served, and we were told that it was a complimentary dish from the chef. 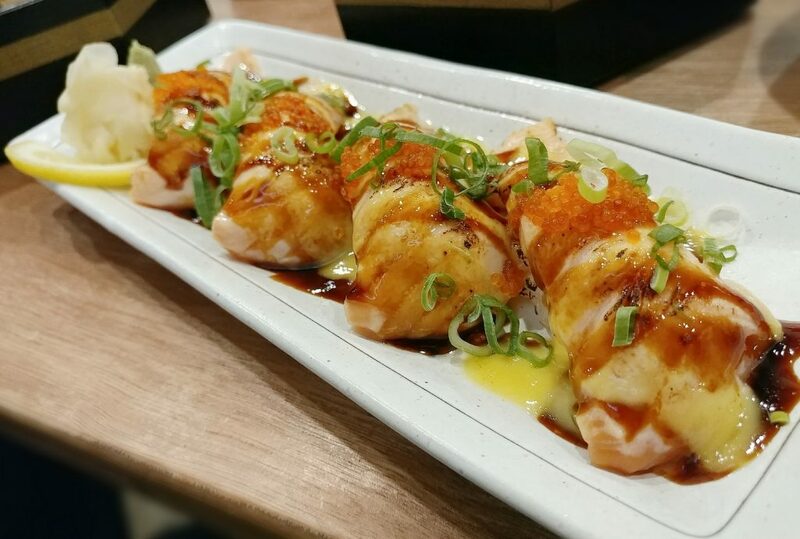 The nigiri pieces were generously drizzled with a teriyaki glaze and another sauce that we couldn’t identify, but was creamy and a little tangy. The salmon had smoky flavour from the flame, but was still supple and tender, and not overcooked, with a raw pinkness right in the middle. The pickled ginger slices on the side were sweet, fiery, crisp, and definitely palate-refreshing. The Aburi salmon nigiri closer. 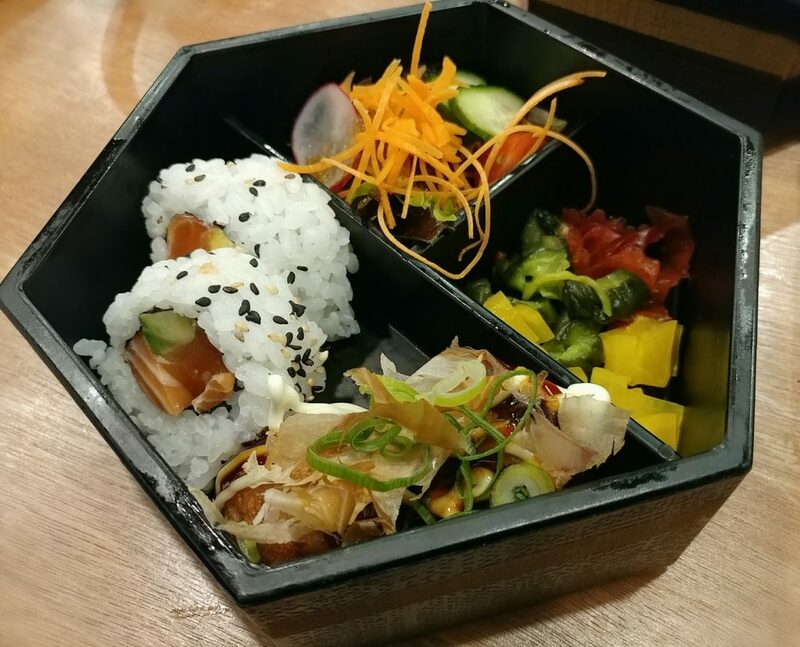 As the menu indicated, each of the bento boxes came with miso soup, salad, takoyaki, two sushi roll pieces, and Japanese pickles. 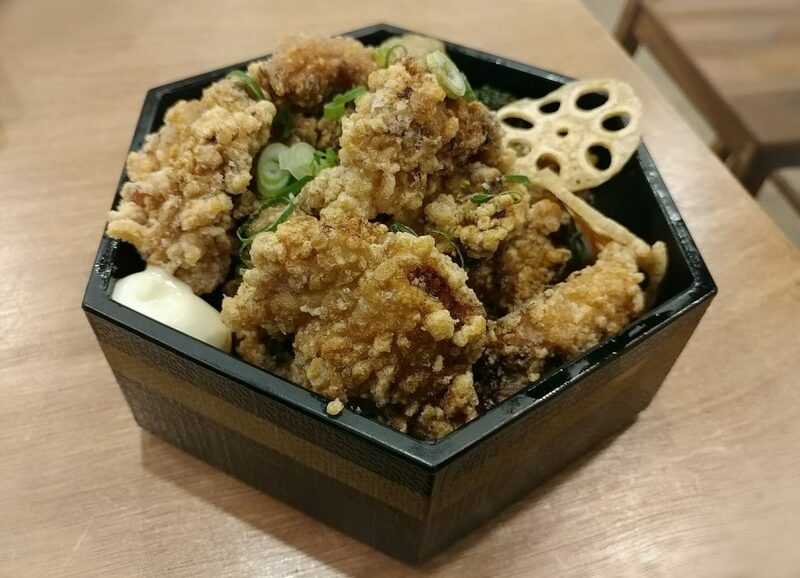 From the many main component options, we picked the Karaage chicken, as we thought that that was an item quite popularly served in Japanese eateries, and so a good marker for standard, and the Sushi and sashimi bento box. 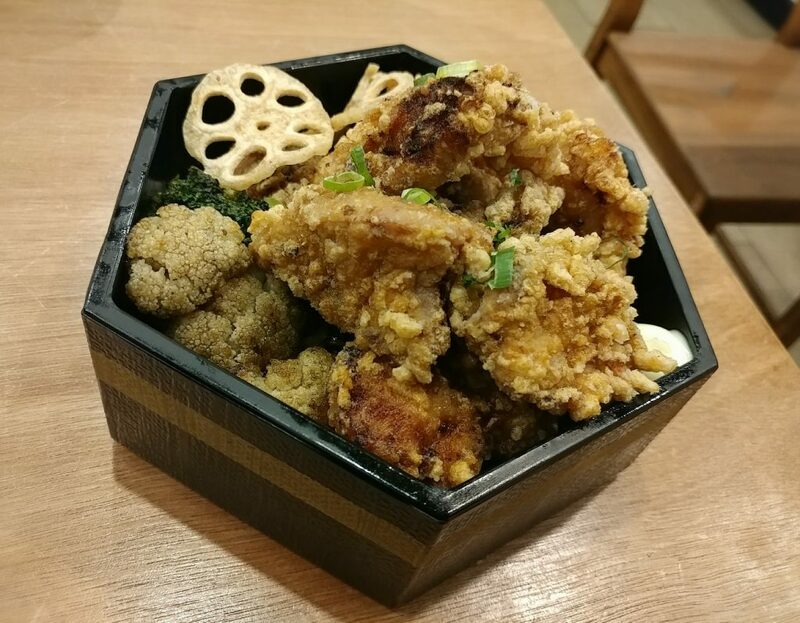 The items were served in hexagonal containers, with the main dish in one tray, and the side components in their own partitioned tray. 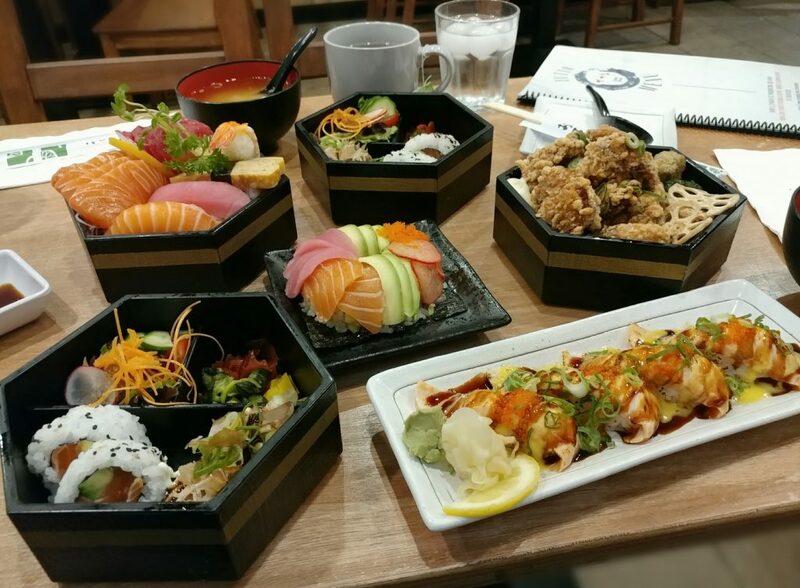 Hexagons are the most efficient packing shape, so you could order a series of items and cover the table with a honeycomb of food..
What a bento set looks like, with the main component, accompaniments, and bowl of miso soup. The Karaage chicken box came with a good amount of fried chicken. 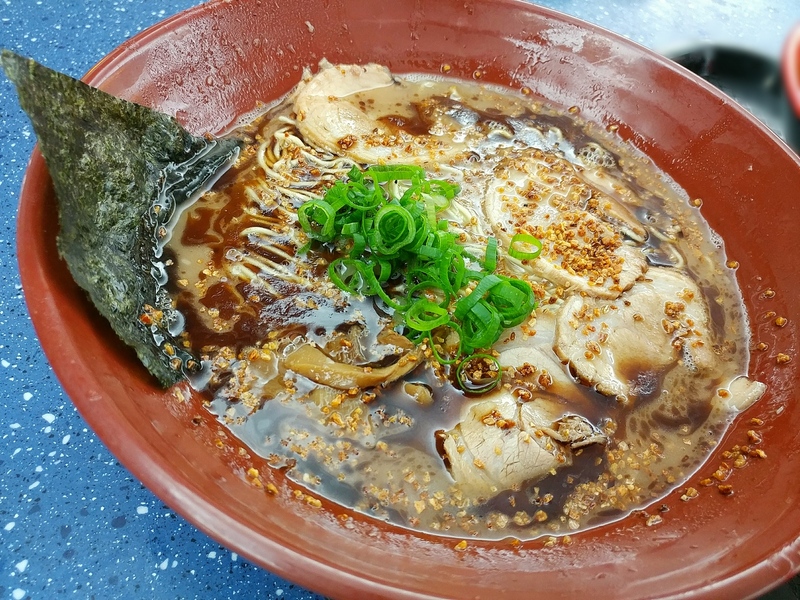 The chicken pieces were covered in a light, crunchy batter, and the meat underneath that layer tender and nicely seasoned, so that it had flavour, but wasn’t too salty. We would certainly rate their karaage chicken as being up to standard. 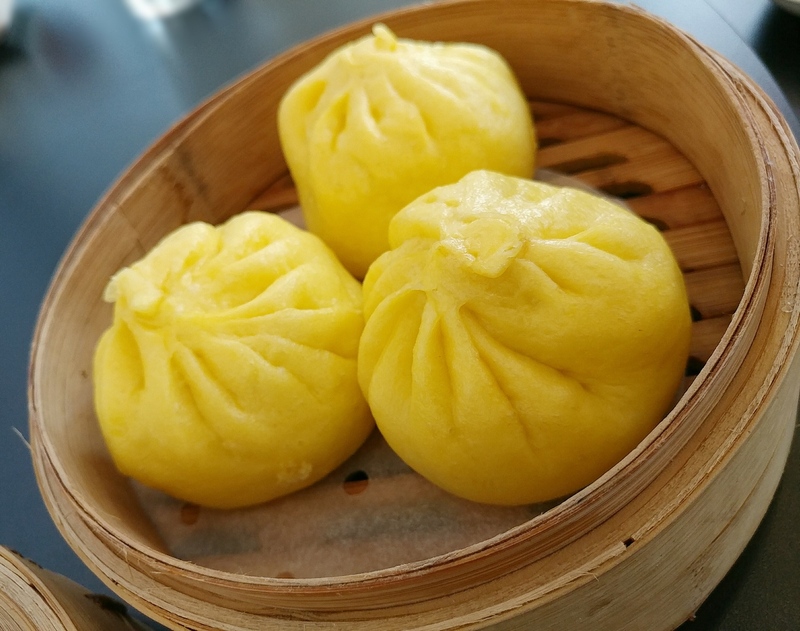 A blob of kewpie mayonnaise allowed you to add creaminess and a little tanginess to your bites. 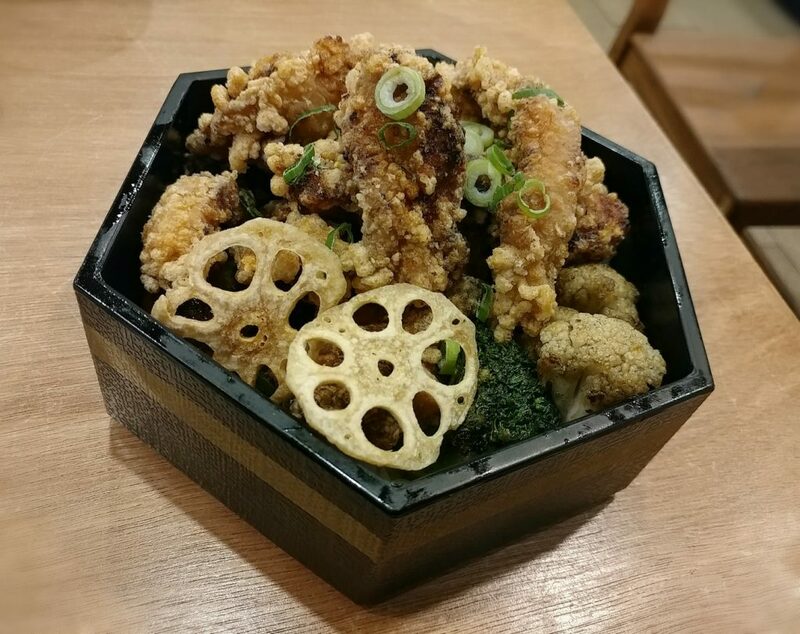 Along with the chicken, the box also had stir fried vegetables, crunchy lotus root chips that doubled as a feature decoration, and a bed of sushi rice. The Karaage chicken part of the bento box. The box also has fried lotus root chips and stir fried vegetables. 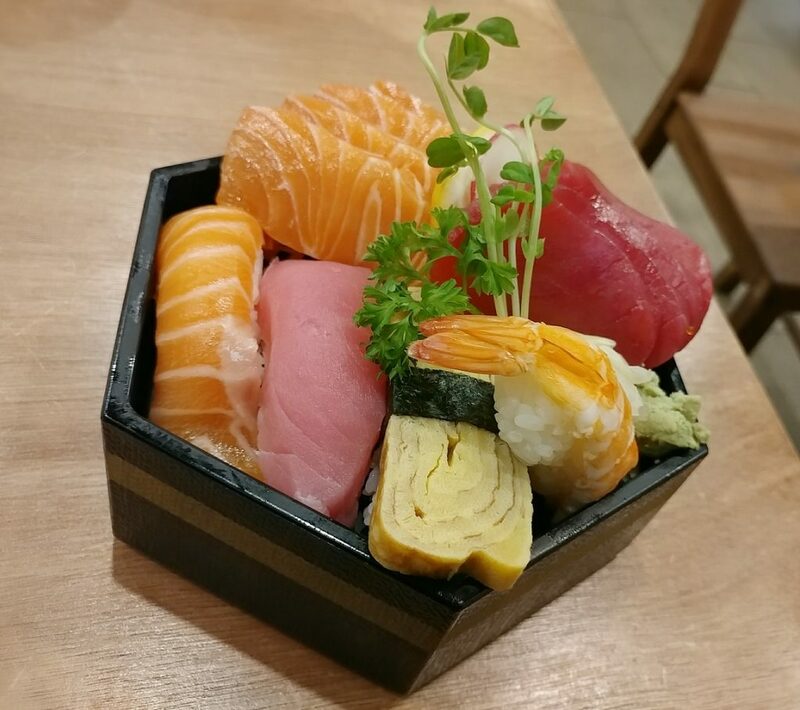 The Sushi and sashimi box was more colourful in presentation. It came with slices of salmon and tuna sashimi, and pieces of nigiri (salmon, tuna, prawn, and tamago). The sashimi slices were fresh and well cut, so that they were not stingily thin, and not excessively thick. The salmon was tender and melt-in-the-mouth. The tuna was a deep red, as one wants in really fresh tuna, and it had a good, firm mouthfeel. Importantly, there were no sinewy bits in it, unlike what we have unfortunately encountered at other sushi restaurants. The nigiri had vinegared, sticky sushi rice that was compacted just right so that it wasn’t too dense a brick, but held together well when you were eating it. A slick of wasabi between the rice and the toppings gave it just a little heat. There was additional wasabi in the tray, so you could add more if you wished. The tamago was light, soft, and just slightly sweet, with no burnt bits in the neat roll. 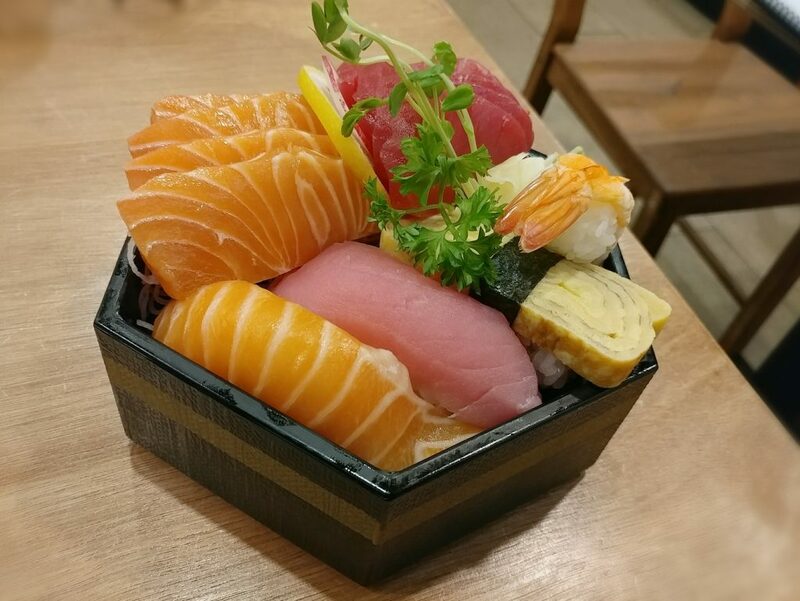 The Sushi and Sashimi box, with salmon and tuna sashimi, and salmon, tuna, prawn, and tamago nigiri. 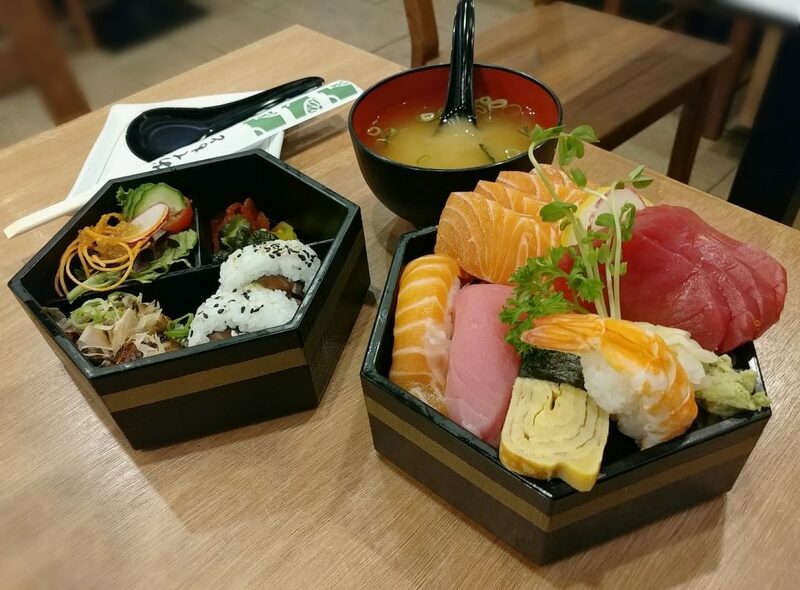 The Sushi and sashimi box from another angle. As mentioned, with each of the bento sets came a number of accompanying items. 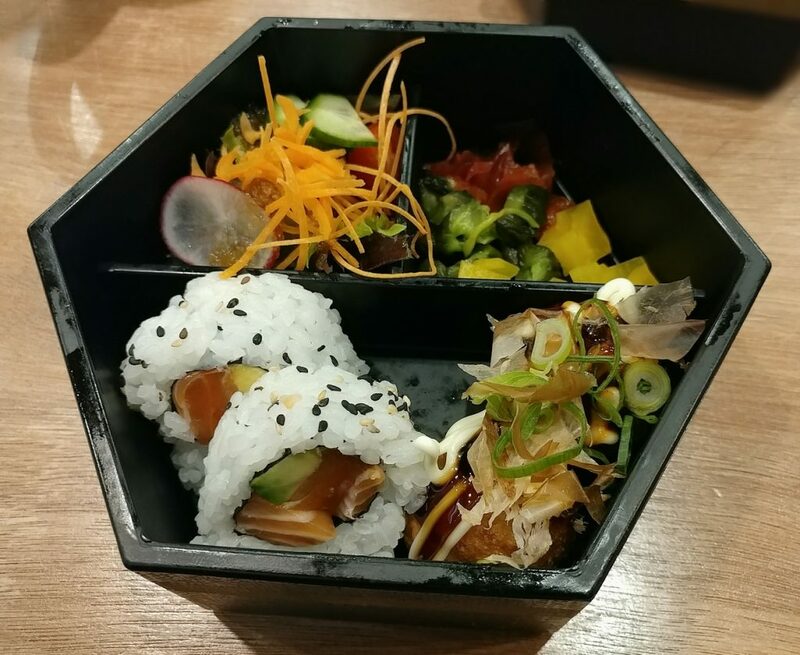 The partitioned box held two takoyaki, two pieces of salmon and avocado roll, a salad, and Japanese pickles. 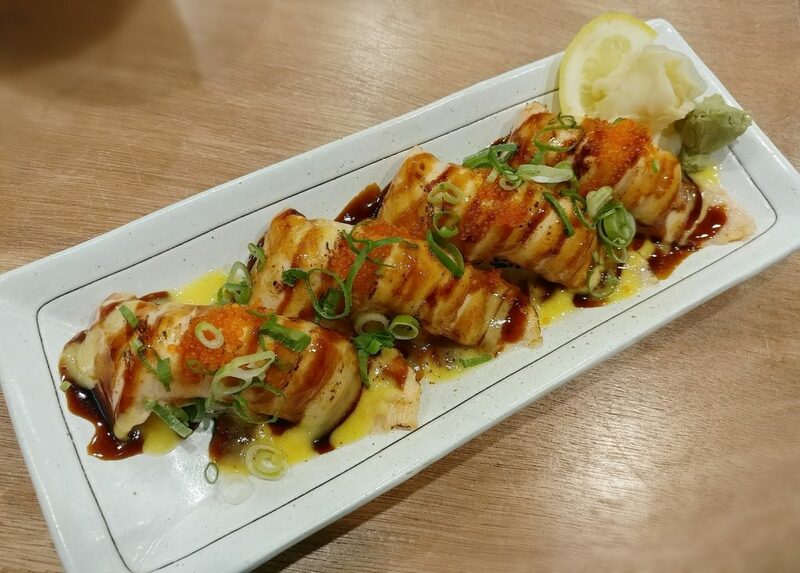 The takoyaki were crisp on the outside, and soft and squishy just beneath that, with a piece of chewy octopus in the centre. 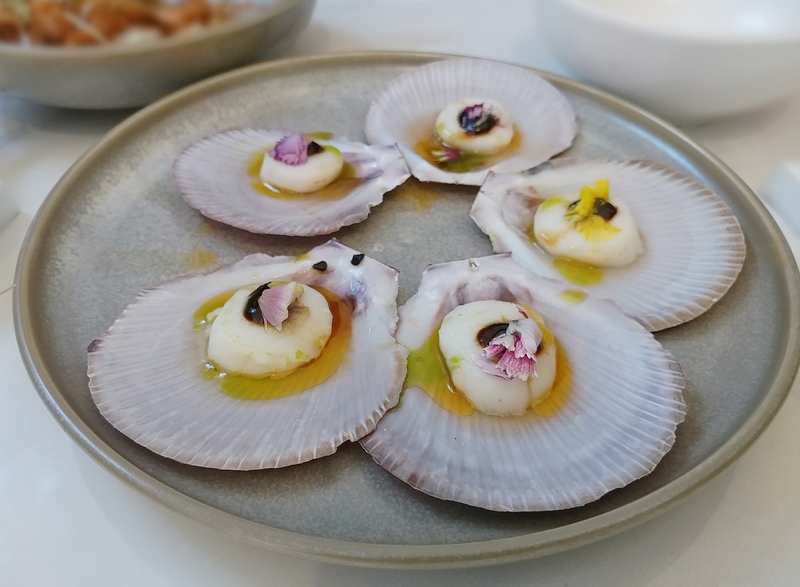 They were drizzled with sweet sauce and mayonnaise, and topped with bonito shavings. Biting into them, the texture and flavour combination stood up to the takoyaki we had had in Dotonbori (and we have visited many takoyaki stalls). The box of accompanying components. Clockwise from the top, salad, pickles, takoyaki, and sushi rolls. The box of sides from another side. One takoyaki in close up. 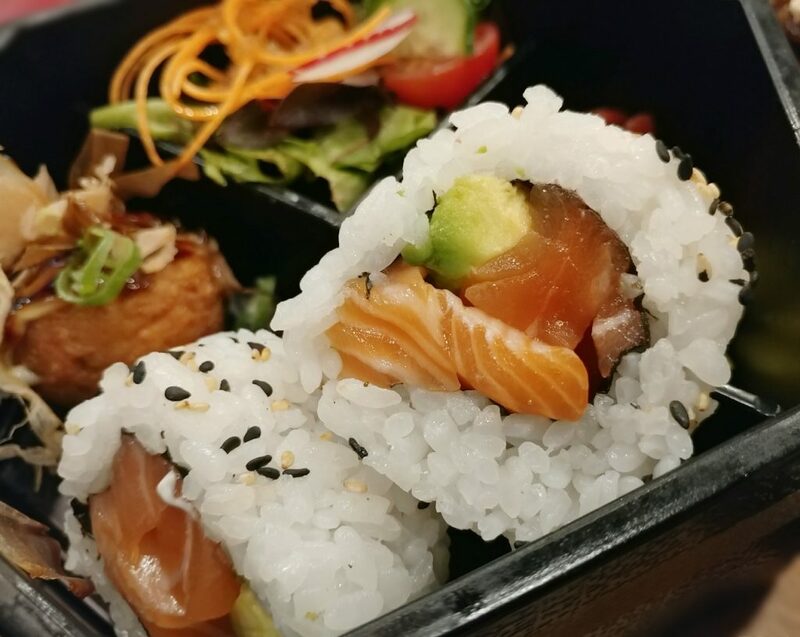 The salmon and avocado rolls had a good ratio of fillings to the rice layer outside, with generous amounts of tender salmon pieces, and creamy avocado. The salad was fresh, with a moreish sesame and ponzu dressing. 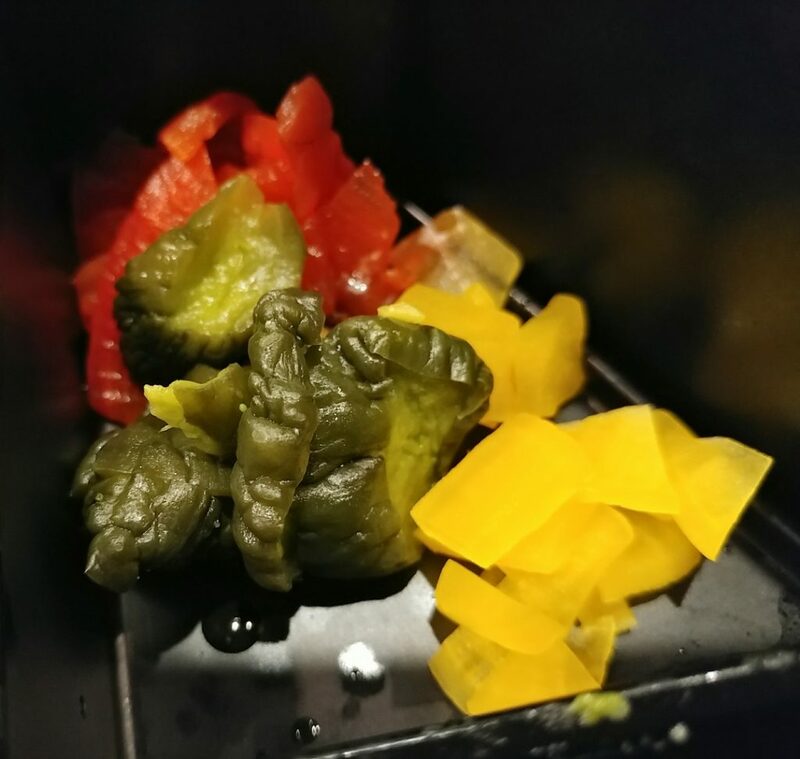 The pickles added vibrant colours to the tray, and each had a slightly different texture and balance of acidity and sweetness, from the taukuan to the kyurizuke to the fukujinzuke. 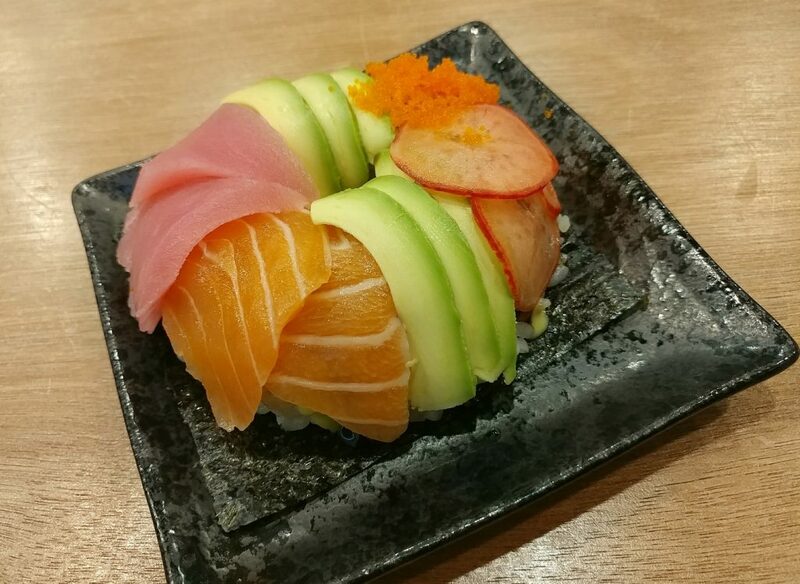 The salmon and avocado rolls. Waitstaff were polite, friendly, and attentive, and we felt well looked after. Our hot green teas were topped up multiple times, and they frequently checked that the food was alright. A summary of the dishes we had. 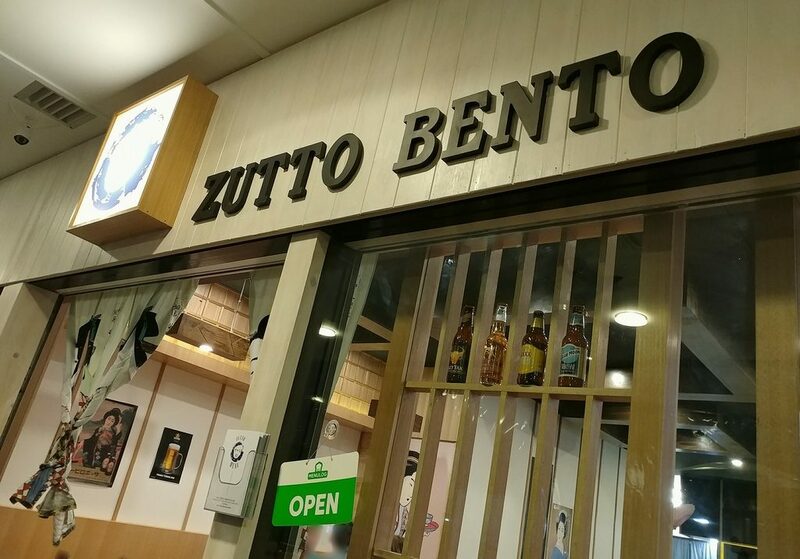 All in all, we enjoyed our meal at Zutto Bento. The food was delicious and well done. The precision and care that goes into their sashimi and sushi was evident. We learned that the chef (also one of the owners) has been working as a sushi chef for over ten years, which helps to explain this. Also important when it comes to quality sashimi is freshness, and they told us that they get fresh fish in every day. 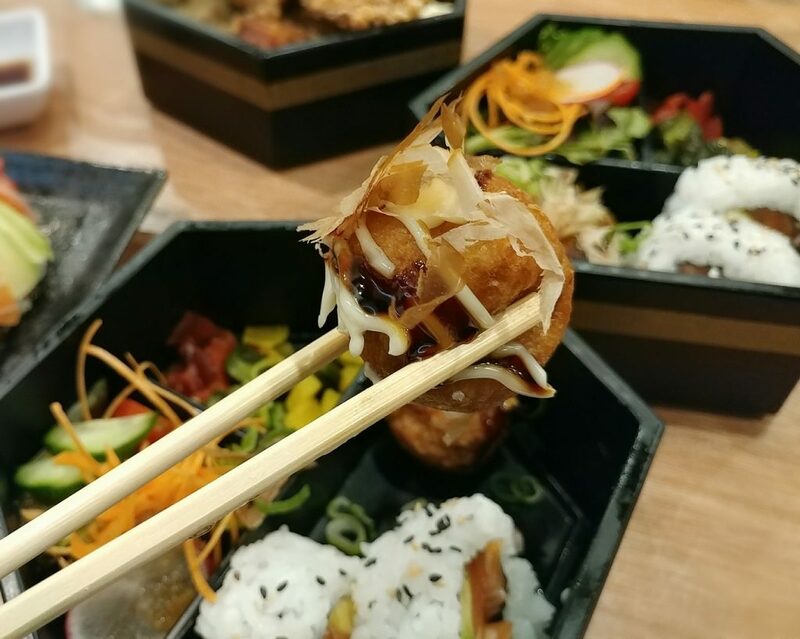 The bento boxes are excellent value, and the sides you get with them are more than just token filler. Those sushi doughnuts aren’t just a gimmick. 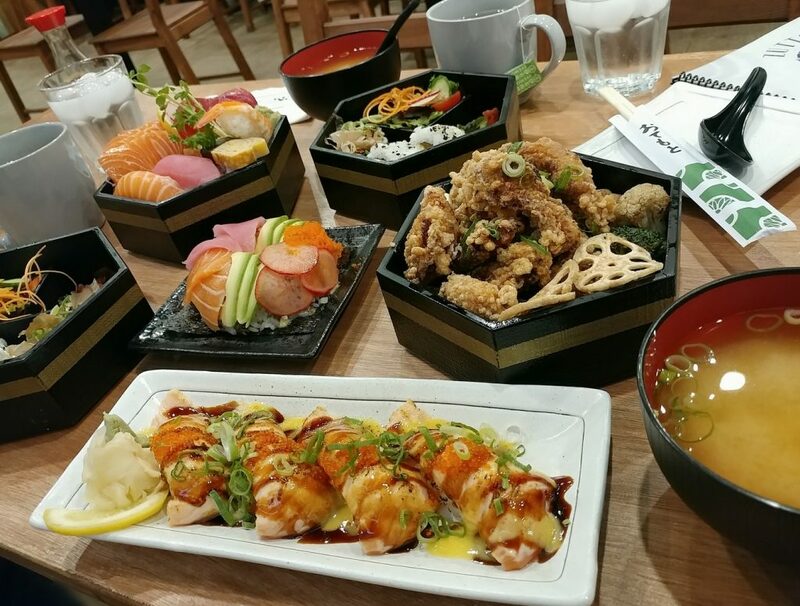 This is certainly a gem worth visiting if you like Japanese food. We just couldn’t fit all the dishes in to one shot..
Price point: Entrees $6. Sushi doughnuts $6 to $7.50. Mains $14 to $22.